Of the three Danaus species that occur in Singapore, the Black Veined Tiger is often considered the least common amongst the three. However, where its host plant, a Cynanchum sp. is abundant, the Black Veined Tiger can be found in decent numbers. This species is often confused with the Common Tiger (Danaus genutia genutia), but can easily be separated by its broader submarginal hindwing black border. The hindwing ground colour is also generally whiter in appearance. 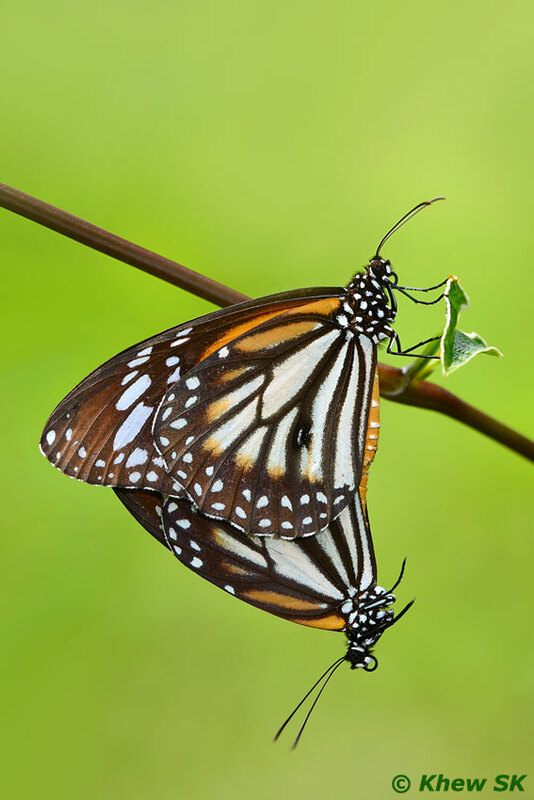 This mating pair of Black Veined Tigers was observed on this first day of 2013 at the Pasir Ris Park's Butterfly Garden. It is interesting to observe that in this case, the male did the flying. When approached, the alert male would fly off, carrying the passive female as he looks for a safe place to hide amongst the bushes at the Butterfly Garden.